DALLAS – September 21, 2016 – Combining targeted radiation therapy with a neutrophil stimulant enhances anti-tumor immunity, according to new research into cancer immunology at UT Southwestern Medical Center. Radiation therapy is one of three core modalities to treat cancer. Researchers found that radiation therapy targeted against a tumor can act as a “cancer vaccine” by causing neutrophil-mediated tumor cell death that alerts the immune system to fight the cancer cells at other anatomical sites. The so-called “abscopal effect,” in which radiation therapy delivered to a primary site of cancer also results in shrinkage or elimination of cancer cells in non-irradiated metastatic sites has been observed for decades. Findings from the study are reported in the Proceedings of the National Academy of Science of the United States of America. Researchers discovered what happens inside the tumor after radiation and how these events not only kill tumor cells but also lead to a whole-body anti-tumor response. Study results show that neutrophils, the most abundant white blood cell in the body, are key players in the radiation-induced anti-tumor immune response. In the absence of radiotherapy, cancer cells transform neutrophils into tumor-associated neutrophils or TANs to help promote cancer cell growth. Radiation therapy, in addition to destroying TANs, recruits new neutrophils into the tumor. The radiation-induced neutrophils (RT-Ns) attack the tumor cells by producing molecules that damage them. The study further demonstrates how RT-Ns are also key players in generating a downstream tumor-specific, T cell-mediated anti-tumor immune response. “To our knowledge this is the first study to identify RT-Ns and to demonstrate their anti-tumor activity via both innate and adaptive immune responses,” said Dr. Tsuguhide Takeshima, Instructor in Radiation Oncology and the lead author on the report. Importantly, the researchers were able to discover a way to enhance the tumor killing capacity of the RT-Ns by administering G-CSF (Granulocyte-colony stimulating factor), a naturally occurring protein (cytokine) in the body that stimulates bone marrow to produce more white blood cells including neutrophils. In the clinic, G-CSF is widely used to treat blood cell deficiencies in patients receiving chemotherapy. Researchers found that the combination of G-CSF and RT-Ns potentiated the anti-tumor immune response, presumably by inducing a more robust neutrophil response. “We think these are exciting finding that should be easily translatable to the clinic since G-CSF is routinely used to treat neutropenia,” said Dr. Ellen Vitetta, Professor of Immunology and Microbiology, and holder of The Scheryle Simmons Patigian Distinguished Chair in Cancer Immunobiology, and a coauthor on the publication. Dr. Hannan is the principal investigator on three ongoing clinical trials at UT Southwestern Medical Center that strategically combine radiation therapy with immunotherapy for cancer patients. The research was supported and performed in close collaboration with UT Southwestern’s Department of Radiation Oncology and Department of Immunology. 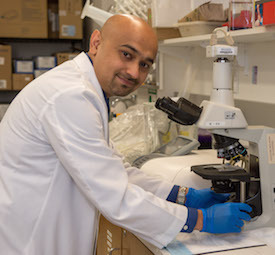 Other researchers include Dr. Laurentiu Pop, former research scientist in Immunology and now instructor in Internal Medicine; Dr. Aaron Laine, Assistant Professor of Radiation Oncology; and Dr. Puneeth Iyengar, Assistant Professor of Radiation Oncology. UT Southwestern’s Department of Radiation Oncology has pioneered new and successful radiotherapy techniques and conducts innovative bench research with the hope of developing better cancer treatments, while treating patients at three locations: the W.A. Monty & Tex Moncrief Radiation Oncology Building, the Harold C. Simmons Comprehensive Cancer Center – Radiation Oncology facility, and the Annette Strauss Stereotactic Treatment Center at Zale Lipshy University Hospital. The Department comprises one of the most comprehensive radiotherapy treatment centers in the world, with advanced tools and procedures that include Gamma Knife, CyberKnife, stereotactic ablative radiotherapy (SAbR), accelerated partial breast irradiation, intensity-modulate radiation therapy (IMRT), and intraoperative brachytherapy.